Hypericum japonicum Thunb. ex Murray, Syst. Veg., ed. 14, 702. July 1784: Thunb. Fl. Jap. 295, pl. 31. August 1784; Choisy in DC. Prodr. 1: 549. 1824; D. Don, Prodr. Fl. Nepal. 219. 1825; Royle, Ill. Bot. Himal. 131, t. 24, f. 2. 1834; Dyer in Hook. f. Fl. Brit. Ind. 1: 256. 1874; Levl. in Bull. Soc. Bot. France 54: 593. 1907; Hayata, Icon. Pl. Formosa 1: 78. 1911; Hand. -Mazz. Symb. Sin. 7: 404.1931; Suzuki in Masamune, Short Fl. Formosa 141. 1936; Y. Kimura in Bot. Mag. Tokyo 54: 87. 1940, pro parte excl. var. lanceolatum Y. Kimura;海南植物志2. 5 2, f. 316. 1965;中国高等值物图鉴2, 878, f. 3485. 1972; N. Robson in Blumea 2a: 267. 1973 et台湾植物志2: 633, pl. 430. 1976.——Brathys japonica (Thunb. Murray) Wight, Illustr. Ind. Bot. 1: 113. 1838-40. ——B. laxa Bl. Mus. Bot. Lugd. -Bat. 2: 19. 1856. ——Hyperi cumlaxum (Bl.) Koidz. in Bot. Mag. Tokyo 40: 344. 1926. ——Sarothra japonica (Thunb. ex Murray) Y. Kimura in Nakai ＆ Honda, Nova Fl. Japon. 10: 235, pl. 78. 1951. ——S. laxa (Bl.) Y. Kimura in Nakai ＆ Honda, Nova Fl. Japon. 10: 241, pl. 79. 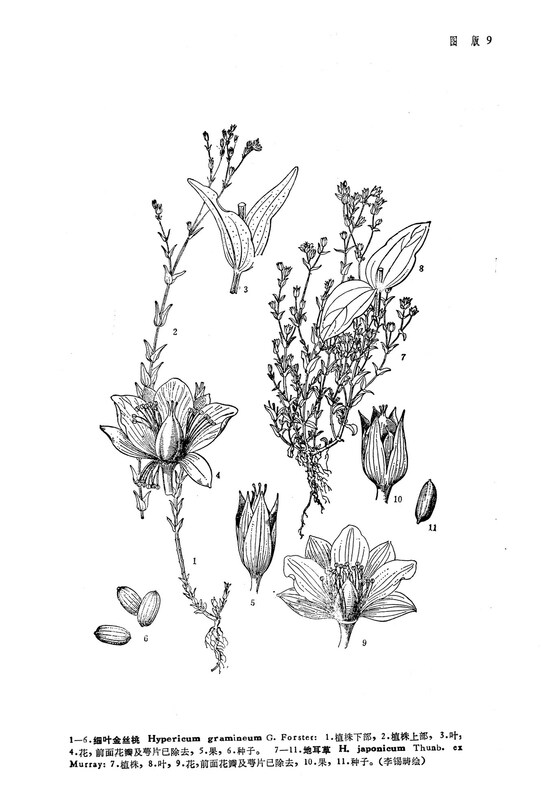 1951.——Hypericum yabei Levl. et Van. in Bull. Soc. dot. France 53: 498, 501. 1906, non Levl. et Van. 1908. ——H. thunbergii Franch. et Sav. Enum. Pl. Jap. 2: 300. 1878. ——H. japonicum Thunb. ex Murray vat, thunbergii R. Kelley in Bull. Herb. Boiss., ser. 2, 8: 185. 1908. ——H. cavaleriei Levl. in Bull. Soe. Bot. France 54: 593. 1908. ——H. japonicum Thunb. ex Murray var. cavaleriei (Levl.) Koidz. Fl. Symb. orient, As. 92. 1930. ——H. japonicum Thunb. ex Murray var. maximowiczii R. Kelley in Bull. Herb. Boiss., ser. 2, 8: 185. 1908. ——H. japonicum Thunb. ex Murray var. calyculatom R. Kelley in Bull. Herb. Boiss., ser. 2, 8: 186. 1908. ——H. japonicum Thunb. ex Murray var. kainantense Masamune in Trans. Nat. Hist. Soc. Formosa 33: 168. 1943;海南植物志2, 52. 1965. ——H. mutilum auct. non Llnn. : Maxim. in Bull. Acad. Sci. St. Petersb. 27: 436. 1832, et auct. plur.